The five great patriarchal Basilicas are ST. JOHN LATERAN, the cathedral and mother church of the world ST. PETER IN VATICANO, ST. PAUL OUTSIDE THE WALLS, ST. MARY MAJOR and ST. LORENCE OUTSIDE THE WALLS. These with basilicas of Santa Croce in Gerusalemme and S. Sebastiano, comprise the Seven Churches of Rome. Among minor basilicas rank Sant'Agnese fuori le mura, Santi Apostoli, Santa Cecilia, San Clemente and Santa Maria in Trastevere. Some churches are open only for a short time in the morning and evening. Most churches ask that sightseers do not visit the churches during a service. Be sure to wear adequate cloths to enter churches and basilicas: if you are wearing shorts or if you have bare shoulders you could be stop from entering some churches. The Basilica of St. John Lateran — in Italian, the Basilica di San Giovanni in Laterano — is the cathedral church of Rome and the official ecclesiastical seat of the Pope. 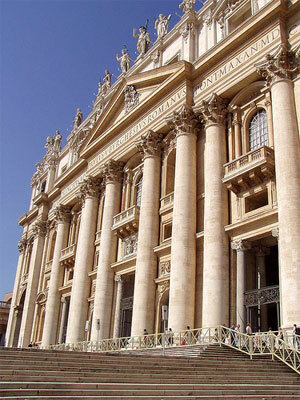 Officially named Archibasilica Sanctissimi Salvatoris (Archbasilica of the Most Holy Savior), it is the oldest and ranks first among the five major basilicas, and holds the title of ecumenical motherchurch among Catholics. 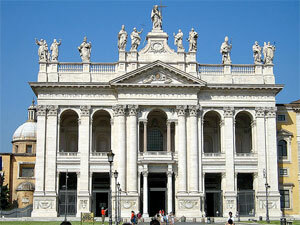 An inscription on the façade, Christo Salvatore, dedicates the Lateran as Archbasilica of the Most Holy Saviour, for all patriarchal basilicas are dedicated to Christ himself. As the cathedral of the Bishop of Rome, containing the papal throne (Cathedra Romana), it ranks above all other churches in the Catholic Church, even above St. Peter's Basilica in the Vatican. The huge basilica of St. Peter's in Vaticano is the most important Roman Catholic church in the world and is one of the most visited places in Rome. It is the composite work of some of the greatest artists of the 16C, and and a masterpiece of the italian High Renaissance. Orientated towards the west and approached through its monumental piazza, the church has its fitting culmination in Michelangelo's dome. 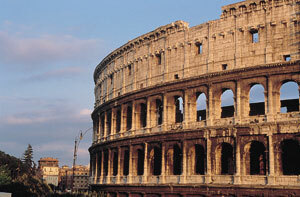 Experience the wonder of the Vatican on this three hour walking tour with a native English-speaking guide. See the three major attractions - St. Peter's Basilica, Vatican Museums, and the Sistine Chapel, as well as numerous lesser known highlights. Don't be overwhelmed by the reputation of the Vatican, let your experienced guide enable you to fully appreciate your visit. Visit all of the most important sights of Vatican City as well as skipping the lines on this comprehensive tour! Your tour starts early, leaving ample time to appreciate the Vatican's Sistine Chapel and Raphael's Rooms as well as other stunning attractions, St. Peter's Basilica and St. Peter's Square. Basilica di San Paolo fuori le Mura is one of five churches considered to be the great ancient basilicas of Rome, Italy. 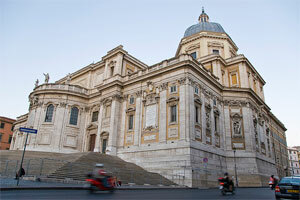 It is the largest church in Rome after St. Peter's. 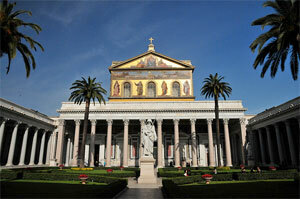 The church commemorates the martyrdom of of St. Paul and is believed to contain he Apostole's tomb. The Basilica di Santa Maria Maggiore — also known as the Basilica di Santa Maria della Neve and Basilica Liberiana in the Italian language and Saint Mary Major Basilica in the English language — is one of five great ancient Catholic basilicas of Rome. Built over the pagan temple of Cybele, Santa Maria Maggiore is the only Roman basilica that retained the core of its original structure, left intact despite several additional construction projects and damage from the earthquake of 1348. It contains important mosaics and elaborate tombs and sumptuous chapels erected by the popesin the 16C and 17 C.
The Basilica di Santa Maria Maggiore is the largest and most important place of prayer dedicated to the Blessed Virgin Mary. 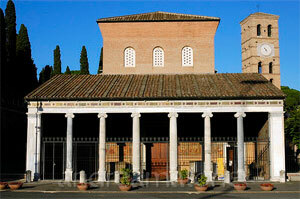 The basilica of San Lorenzo fuori le Mura is one of the seven pilgrimage Churches of Rome. It has remarkable architectural features, including two storeys of ancient columns in the presbytery, super Cosmati work, and extensive catacombs off the lovely cloister. despite serious war damage it retains its venerable character. It is a much more peaceful and friendly church to visit than some of the other major basilicas such as S. Paolo fuori le Mura and S. Giovanni in Laterano.